I am currently doing an ‘every day in May’ drawing challenge together with others. They suggest ordinary objects and challenge you to draw on one a day. Doing art seems to always slip to the bottom of the pile, even though I know it is vital to me. 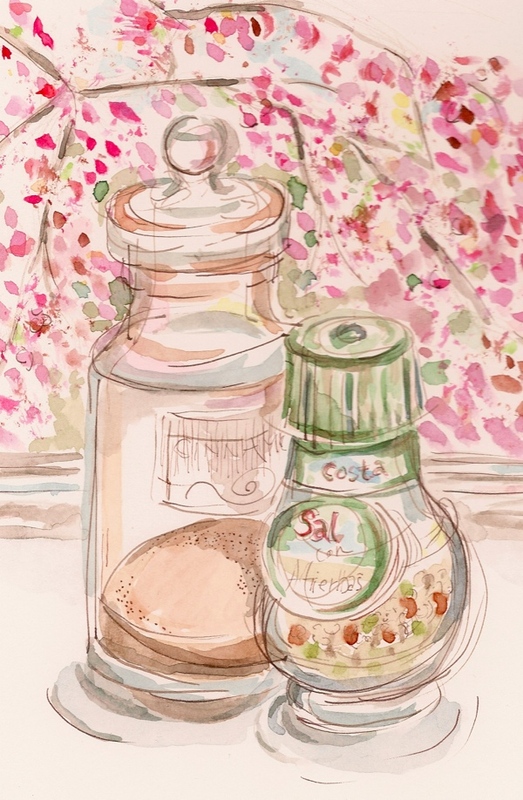 I started the challenge late, so I was catching up by combining the blossoming cherry tree out my window and two spices – one a jar I made up of cinnamon sugar – yum… and the other a bottle of spiced salt from time in Madrid that I have saved from a grocery store expedition years ago. As I drew and painted, I found that bits of my life and the wider world opened up and came together in the midst of my adventure with watercolor and ink.